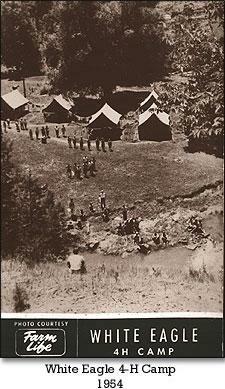 The camp history of Camp Kupugani can be dated back to the 1800s. In April 1951, the Board of Directors for the 4-H Camp of Northwestern Illinois purchased an original parcel of 110 acres of Midwest timberland along the Leaf River from brothers Ben and Deed Sjoberg. Later donations brought the site to its present 126 acres. The camp was named White Eagle, in honor of the old White Eagle Mill. Built in 1837 and located on what is now camp property, the mill was a significant source of the region’s livelihood. Exactly how the mill came to be named White Eagle is unknown. One legend is that a rare white eagle was seen in the area when the mill was founded. Indeed, on warm days, a strong upward thermal wall of air rises from the Leaf River Valley. Soaring birds ride along this updraft and there are regular eagle sightings. Today, a large hawk controls the area. As it soars over camp, its white underside brings to mind the old White Eagle legend. Camp Kupugani continues to honor the region’s history, with the mill wheel in our dining hall forming the base of the fireplace. Even back when the mill wheel made its initial appearance at camp in 1951, the commitment to teaching quality character development, appreciation of nature’s beauty, and the development of valuable relationships was strong. For almost seven decades since then, the camp has brought children together to celebrate nature, one another, and themselves. It is in this spirit that we look forward to our next seven decades!